I love creating new recipes and made quite a delicious one. My husband had made BBQ pulled pork and we had a bunch leftover for meals during the week. I created a very tasty frittata that is full of vegetables and can be eaten for any meal of the day. I was sent a bunch of organic greens from OrganicGirl to try. This recipe includes a package of the baby kale. 1. 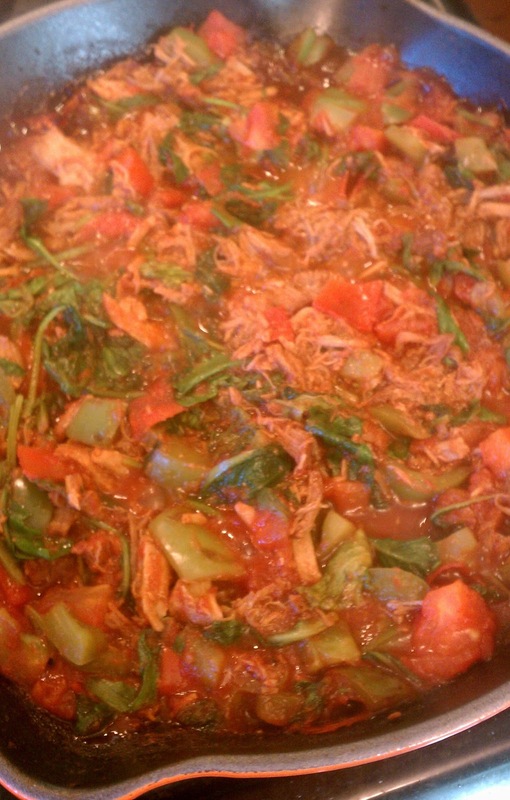 In a nonstick pan, add chopped green pepper and tomatoes with a bit of water. Cook for a few minutes until semi-soft. 2. Add tomato sauce, greens and pulled pork and cook for a few minutes longer. 3. Meanwhile, whisk eggs with skim milk and black pepper. 4. Evenly disperse ingredients throughout the pan and add beaten eggs. 5. Cook over a medium heat until egg mixture is cooked on the bottom but is still runny on top (since it would burn if you tried to cook it all the way through on the stove). 6. Add cheese on top and broil for 5 minutes or until cheese is bubbly and eggs are cooked through. This recipe turned out really well and my husband and I both enjoyed it. It also makes great leftovers that heat up well. I loved getting a big dose of vegetables in a meal that tasted very indulgent. Frittatas are such a fun and easy way to make a delicious meal. The OrganicGirl greens were very tasty and fresh. Sounds amazing. I love adding extra greens to any dish, especially one that is cheesy and meaty :) I load up on the greens because they shrink so well....and just blend right in!